It is ‘inspirational entertainment’, but it is on a whole new level… welcome to the untold stories, the conversations we haven’t had yet but are ready to have. More depth, laughter, authenticity, honesty and ah ha moments. This is the show you bring your girlfriends to and to share as husbands and wives. This is the ADULTS ONLY SHOW. We take the challenges of life and dare to see the lighter side… we allow ourselves laughter when we thought there was nothing to laugh about… and we get back up through the chaos. Discover how the ability to stay connected to our sense of humour is one of the greatest emotional workouts we can have. You are invited to find the fun in the not so funny, rise up through the moments that could have kept you down and laugh hard and loud because it feels so damn good! This is not the SHOW to come to if you are easily offended or find it hard to find the laughter in the serious and the deep. It’s inspirational entertainment at its best! 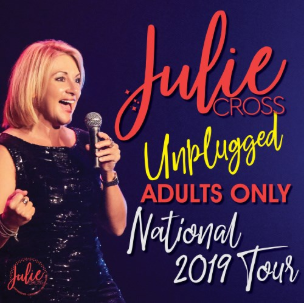 Julie is an Inspirational Entertainer, Multi-Award Winning Speaker and Semi Finalist in Stand Up Comedy. Absolutely loved your show last night Julie! You are such an inspirational entertainer. ?? Thank you Julie Cross, I had a wonderful time last night at your show. You truly are an inspiration. I laughed, I cried (so much the lovely lady next to me handed me a tissue – thank you!) and then I laughed again. If you haven’t yet, do yourself a favour and go and see Julie in her amazing show. You won’t regret it!!!! Great night, Julie!! Thank you and keep sparkling, you are fabulous!!! ???❤️? What an inspirational night (or do I call it a show, or an event or a seminar I can’t remember the correct term now lol). It was amazing and I will be back thanks Julie you are one incredible person…..Thanks for the sparkle. Brilliant show once again! Thank you so much for all the laughs and tears…such a great night. Keep sparkling! Great night again thank you Julie Cross. Thank you .. it’s been a couple years since I saw your show last… (This is now my 3rd show)… I needed reminding of a few things..I believe you “ get what you give”, and you know what , even I see feathers and you are the person I think of …continue to sparkle, I aim to shine as bright as you, with you ? Love Love Love your show! You were amazing ? Was a great night. Thank you again Julie, lots of love x? Loved the show once again. Laughed, cried and came away inspired again. Thanks Julie, my first show, thoroughly enjoyed it all, a great night and a good laugh. Yet another terrific show, my third but Tania Brown first. Love ya girlfriend and yes took away new thoughts and processes to heal my mindset ? You are fabulous Julie Cross! We thoroughly enjoyed your raw honesty and humour. Life looks different today and I think I like it ? I came last night with three of my closest girls, I wanted them to hear your journey, that I have been blessed to be a part of since Thomas started Kindy.I didn’t expect , to be crying within the first half an hour then again five more times during the course of the evening. I had completely forgotten about the letter from Kindy you wrote but when you mentioned it I remembered it word for word. I was sent down a path of memories, the photos of Flash, the memories you evoked from his funeral, then their Grade 7 graduation. Then the class photo!! ?? ?You didn’t mention the massive clap of thunder and lightning while the kids were waiting to enter the hall…. definitely a message from Flash… Takes an army to raise these kids…. I have always loved and respected you and I love and respect you even more now. You sparkle without the sparkles my friend you are a true diamond, pure and refined… Thank you for the journey and May we make time for that catch up!!! Great night Julie! Haven’t laughed so hard in a while. My hubby loved your CD in the car on the way home. He wants to see you next time too!